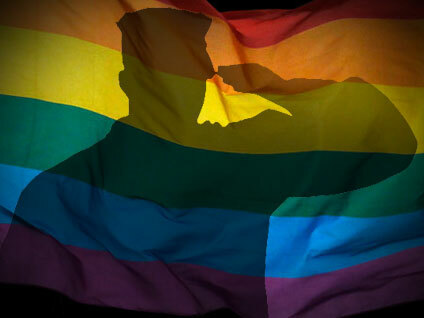 In a major victory for gay rights advocates as well as President Obama, the Senate today voted to repeal the military's "don't ask, don't tell" policy banning gay men and women from serving openly in the military. Now that the repeal bill has overcome its final hurdle in Congress, the president is expected to sign the measure into law next week, bringing to an end the 17-year-old policy and delivering Mr. Obama a victory on one of his chief campaign promises. The Senate voted 65 to 31 to pass the repeal, after overcoming a Republican-led filibuster earlier in the day by a vote of 63 to 33. The House passed its version of the bill on Wednesday. Sen. Joe Lieberman (I-Conn.), the sponsor of the legislation, cast it as an important civil rights bill that reflects "a step forward toward larger societal acceptance" of gay men and women. Eight Republicans joined nearly every Democrat to vote for repeal. The Republicans voting for repeal were Sens. Scott Brown (Mass. ), Susan Collins (Maine), Olympia Snowe (Maine), Mark Kirk (Ill.), Lisa Murkowski (Alaska), John Ensign (Nev.), Richard Burr (N.C.) and George Voinovich (Ohio). "I want to thank all of the gay men and women that are fighting for us today in Afghanistan and Iraq," Collins said after the vote. "We honor your service and now we can do so openly. This is indeed an historic day." Burr explained his surprise decision to vote yes on the final bill by saying that while he still feels the timing is wrong for repeal, he joined the majority because "this policy is outdated, and repeal is inevitable." It was the third Senate vote on the matter, after two previous votes -- in which the measure was attached to a defense authorization bill -- failed amid procedural objections from Republicans who said they were sympathetic to appeal. "This is exactly what the American people want from this Congress," New York Democratic Sen. Kirsten Gillibrand said after the vote. The president released a statement praising the Senate's actions and expressing confidence that the military can responsibly transition to the new policy while ensuring its strength and readiness. "By ending 'Don't Ask, Don't Tell,' no longer will our nation be denied the service of thousands of patriotic Americans forced to leave the military, despite years of exemplary performance, because they happen to be gay. And no longer will many thousands more be asked to live a lie in order to serve the country they love," Mr. Obama said. "It is time to close this chapter in our history. It is time to recognize that sacrifice, valor and integrity are no more defined by sexual orientation than they are by race or gender, religion or creed." During debate over the repeal this morning, Senate Majority Leader Harry Reid quoted the late Sen. Barry Goldwater: "You don't have to be straight to shoot straight," he said. "The fact is removing a form of legalized discrmination from our books is not a liberal or conservative idea, it's not a Democratic or Republican idea," said Lieberman. "It's an American idea consistent with American values." The repeal was met with resistance down to the very last moment from Republicans who argued the repeal would have a negative impact on the nation's armed forces. "Today's a very sad day," said Sen. John McCain (R-Ariz.), the top Republican in the Senate Armed Services Committee. Citing the concerns of Marine Commandant General James Amos, who has expressed opposition to the repeal, McCain said, "When you're life's on the line, you don't want any distraction." Democratic Sen. Joe Manchin of West Virginia did not vote today, but he released a written statement saying he does not support the repeal. Manchin was the lone Democrat to vote against the measure last week, and he said today he remained concerned about the timing and impact of the repeal given that the nation is currently at war. "While I believe the DADT policy will be repealed, and probably should be repealed in the near future, I cannot support a repeal of the policy at this time," he said. Even though the repeal will now surely be signed into law, it will still be some time before it is completely implemented throughout the armed services. After Mr. Obama signs the repeal, he and military leaders must certify the Pentagon study conducted this year which concluded that allowing gays to serve openly would not have long-lasting negative consequences on the military. Then, the Pentagon will begin an implementation plan, which consists of training troops and rewriting all the policies and regulations that would be affected. Taking the necessary time to institute the policy correctly has been one of Defense Secretary Robert Gates' strongest arguments for legislative repeal: If the matter had been left to the courts and they mandate an immediate repeal, he has suggested, the military will not have sufficient time to properly implement the policy change. The Pentagon is being deliberately vague about how long the entire procedure would take, but at one point Gates said it could take up to a year. Gates said in a statement he welcomed the vote. "Successful implementation will depend upon strong leadership, a clear message and proactive education throughout the force," he said. "With a continued and sustained commitment to core values of leadership, professionalism and respect for all, I am convinced that the U.S. military can successfully accommodate and implement this change, as it has others in history." Sen. Carl Levin (D-Mich.), head of the Armed Services Committee, said after today he hopes the repeal will be implemented "sooner rather than later." "Making this change is simply a matter of leadership," he said. Gillibrand said that no one will be dismissed under the "don't ask" policy during the implementation process. Levin praised the military's top leadership for their professionalism on the matter. He specifically paid tribute to Joint Chiefs of Staff Chairman Mike Mullen for telling the Senate during a hearing that allowing gay military personnel to serve openly was a matter of integrity. Mullen's remarks "gave momentum to this effort," Levin said. In a statement following the vote, Mullen said, "No longer will able men and women who want to serve and sacrifice for their country have to sacrifice their integrity to do so. We will be a better military as a result." Advocacy groups in support of the repeal praised the Senate's actions today. "Today's vote is the critical strike against 'Don't Ask, Don't Tell' and toward creating a path that could end in lesbian, gay and bisexual people being able to serve openly, honestly, and to great benefit of our country," Rea Carey, executive director of the National Gay and Lesbian Task Force, said in a statement. "People from every background, every faith, every community across the country know that qualified, patriotic Americans willing to risk their lives by serving in the military should be able to do so, free of discrimination. When full repeal of 'Don't Ask, Don't Tell' is implemented, our nation will honor the principles of fairness and justice that it holds so dearly."